Pages may contain affiliate links. See my disclosure page for more details. 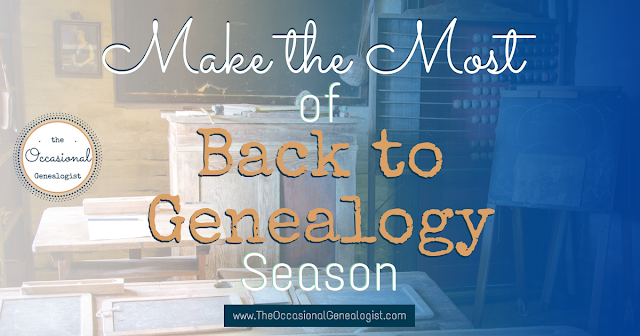 Five ways to make this your best back to genealogy season, ever. Not surprisingly, back to school season is also back to genealogy season. I'm sure it has to do with all those years we all spent going back to school in the fall. 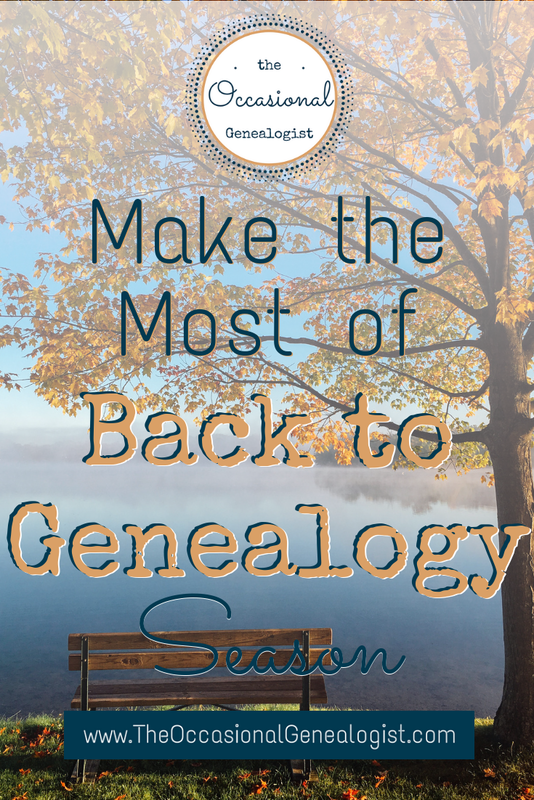 And also like back to school season, you can follow some best practices to make the most of back to genealogy season. Here are five ways to start the genealogy season "right." 1. Spend time together regularly. Did you eat dinner at home every night with your parents during the school year? Maybe, maybe not. The younger you are, the more likely you spent school nights running between activities. Today's advice for school-age families is to eat together X number of nights a week. The same advice applies to your genealogy research. If you want to really accomplish something, you need to spend time on it regularly. As an Occasional Genealogist, I know how hard that can be. Eating together as a family is certainly more important (so don't skip family meals to squeeze in some genealogy!). Time with your family history research is much easier to squeeze in. We are talking about research, it doesn't have feelings. There's no point in "checking-in" and not really being present (i.e. being distracted) but the benefit of regular genealogy requires a minimum amount of time. One example, you can check out my "Lunchtime Genealogist" series on Instagram (and also posted to my Facebook page in the Lunch time genealogist album). It's been on a short (unintentional) break while my real-life back-to-school season has been more hectic than anticipated. However, there are dozens and dozens of ideas of tasks you can do on your lunch break. That means ideas that take 45 minutes or less and don't require you are able to "research" (although you need to either have an Internet connection or access to your existing research---unless you have a really good memory for what you need to work on). This series is for the avid hobbiest with an out of the home job (like I used to be, yes, I'd spend most lunch breaks on genealogy). You can adapt it to your situation, though. 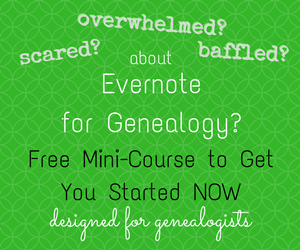 Can't give five lunch breaks a week to genealogy? No problem. Try one of the suggestions each week just to "check-in" with your own research. You don't even have to spend a full 45 minutes. Obviously, the more time you spend, the more you can accomplish. Regular, quick check-ins can keep your most pressing research questions "fresh" so you can do more when you can sit down and focus on planning or research. RELATED POST: Genealogy lists can be a fast way to check-in with your research and create notes that will help later, get some ideas in this post. Back to school is easier when there's structure and organization. No parent wants to hunt for shoes when they're trying to get their kid(s) out the door. Similarly, homework is best done with minimal distractions. The parallel to genealogy should be obvious. You need to be organized so you can find what you need. When it's time to plan or research, you want to focus on what you're doing. I think genealogists have the urge to get back to genealogy in the fall but that doesn't mean they really have the time. I don't know about you, but October (Family History month) is always insane. Here in the south it's finally getting cool enough to do things outside so everyone tries to stuff as many festivals and events in as possible before the holidays. I imagine up north it's the opposite, you want to get them in before it gets too cold (during/after the holidays). If your fall schedule is similar, it's a great time to do bits of organizing when you can't do more genealogy. If you have an office space, tidy up. If you don't have an office space, find suggestions for an organized distraction-free homework space. There's really no difference! Obviously, students need to be regulars at school. Back to school season can be even better when parents can help out at school regularly, too. But I know how this goes. Just because I don't have a commute, doesn't mean I don't have work. It's hard to be a regular helper at school when there's no annual leave or sick leave or even any coworkers to cover a task you've dropped. Genealogy is similar. If you can, being a "regular" at a genealogy event or repository (think attending your local genealogy society meetings or regularly visiting the local library or Family History Center) is great. It may not be practical but make sure you've at least considered it. If physical meetings aren't possible (they don't exist or you physically can't make it), consider webinars. The Georgia Genealogical Society offers free monthly webinars that are NOT specific to Georgia research. These are scheduled regularly, just like a physical meeting would be so you can put it on your calendar. Other groups offer similar options. Routine and regularity really benefit kids. They can benefit you, too. Personally, I hate following a regular schedule. When I quit working in an office, I stopped wearing a watch, intentionally. It was so freeing. But I find I get so much more done with a routine (particularly since having kids in school but you may have a similar situation, such as frequent doctors visits for you or a family member you care for). Having a routine and structure doesn't mean you have to have a perfectly regular schedule. I find I get the most done when I plan two weeks at a time but plan every week. That means I'm reviewing and revising the upcoming week's schedule, not creating it from scratch every week. This allows me to use what worked well, change what didn't, and adjust to the differences in our schedule from week to week. When I do this regularly, it only takes a few minutes (adding in meal planning makes it take longer but the meal planning itself goes much faster since I don't over plan for nights I am NOT going to realistically cook a traditional meal). My planning is obviously pretty involved since I'm self-employed. I have to plan exactly what work I'm going to do or nothing gets done. If you have a boss, work will come your way. Just realize, no matter what kind of job you have, consider if you can achieve more with some advanced planning and structure. This doesn't mean you have to achieve more work at work, it might be completing chores sooner, freeing up your evenings for something like genealogy. For example, could you do a small load of laundry every morning (dried and folded in the evening) instead of doing all the laundry on the weekend? Are there errands you can do during your day that you're currently doing on the way home or on weekends? 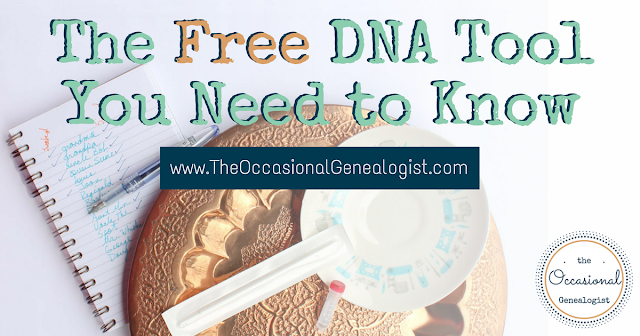 The answer depends on the type of work you do but this is the kind of planning you can do once earlier in the week and free up time you can then spend on genealogy. I'm sure you don't do as much genealogy as you like. Creating structure "in your home" in general can help you do more genealogy. You'll be more efficient in general which will result in more "free time" you can spend as you choose. No, I don't want you to take up a sport. That would just be less time for genealogy. I want you to think outside your current genealogy box. Instead of hunting for surnames, look for a more complete picture of your ancestor as a person. Surname gathering not your problem? Maybe you need to stop focusing on perfect dates and places and start writing your family history. Have you always been focused on writing the family history? Maybe you need to make your tree branch more or branch less, or maybe just focus on some dates and places instead of focusing on how many ancestors. Whatever you've always focused on, try something different. You could add DNA to your toolkit, learn to create a FAN club, focus on a different branch of your tree (or even someone else's tree). There are plenty of options. Don't get in a rut, be a well-rounded genealogist. One note, if you are like the kid that does three activities every night (and that many games on the weekends), you might need to change by focusing on one thing, or one at a time. Just as too many extra-curriculars can rob a student's focus from their actual school work, you can be distracted from the "real" work of genealogy. This back to genealogy season, take a step back and decide on a plan for how to get more better genealogy done. Add a new tool or focus back on the basics, whichever is appropriate for your situation. RELATED POST: Are You Stuck in Your Research? 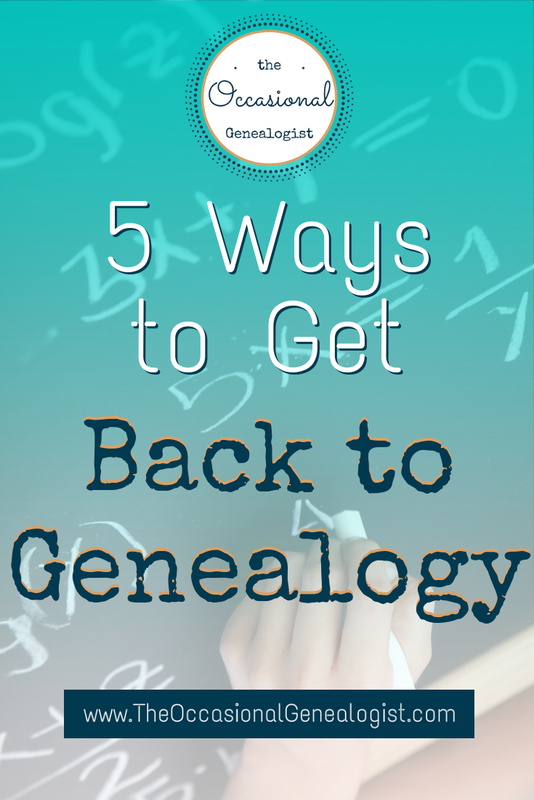 So there are five ways to make this your best back to genealogy season, ever. 1. Spend regular time with your genealogy. Unlike with your family, this does NOT need to be prime quality-time to count. 2. Get organized and clear distractions from your workspace. 3. Be a regular. Consider attending genealogy meetings or visiting a repository regularly. 4. Create structure in your home/life so you can free up time for genealogy. 5. Get involved in extra-curriculars. Be a well-rounded genealogist, just don't be a distracted genealogist. I'm updating the Resource Library. If a link you click to sign-up does not work, try this link instead. 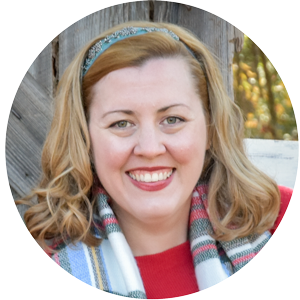 I'm Jennifer, and I'm an Occasional Genealogist... sort of. For over ten years I've been a professional genealogist. I started researching my own family over 25 years ago. Like many of you, I started as an Occasional Genealogist. I had to squeeze research in while in school and while working full-time. Then I got my first genealogy job and for awhile, it was genealogy all the time. Now I have two kids. I do other people's genealogy constantly but my own? Coming up with ways to do great genealogy, despite all the interruptions, is now mandatory. Need to learn more about DNA? 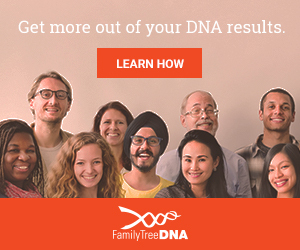 Have You Found the Hidden Features at AncestryDNA?